10 Finds and Discoveries of the Week: Taste. Try. Live. Two new awesome products from TJ's this week. 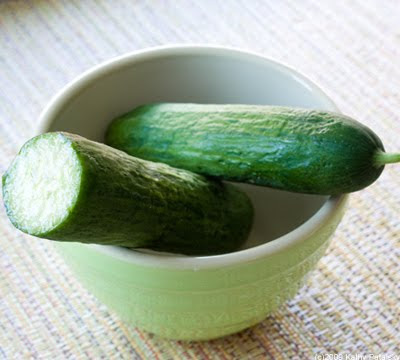 Persian Cucumbers: I was a little hesitant to try these funky new cucumbers at Trader Joe's. They looked like pickles, but claimed to be sweet, crunchy and seedless. Well I tried them and they are amazing. Super crunchy, fresh-tasting and indeed seedless. No mushy seeds. Lovely in a summer salad. In the fridge section. Near the carrots and mushrooms. Trader Joe's Almond Meal: Maybe not new to you, but it's new to me! I bought a pack of TJ's 'Just Almond Meal' which is 100% pure ground almonds. I used it in a few cookie and cake recipes and it worked magic! I substituted 3/4 a cup of flour in each recipe with 3/4 a cup of this almond meal. Yum! My chocolate chip cookies have never tasted better. I will be posting a recipe for my Just Almond 'n Chocolate Chip Cookies, later this week. Vegan baker must try! So one of my fellow judges at Veggie Conquest had a few samples of his 'water creations' at the event. So yum. And healthy. I had a delicious orange colored fig infused water and the Lemon Rosewater was awesome! So if you want some creative beverage ideas and beautiful beverage photography, check it out in the product link. Brian's website is great for food photography lovers. "I'm lactose intolerant. Intolerance is my way. So when I tried and eaten these Gone Pie dairy-free brownies, I couldn't believe they weren't bake cooked with cow butter. They take me back to the brownies of my youth days. Now when I was at Yale...."
"Pumpkin brownies taste good on collectible plates!" 4. 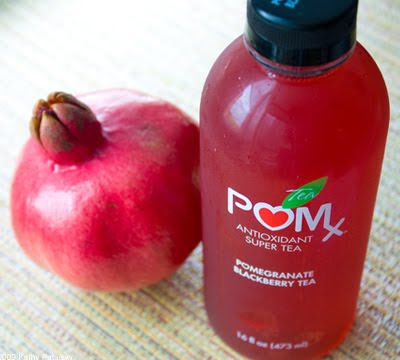 POMx Tea in new flavors! I am a big fan of the POM brand. And I was lucky enough to receive new flavor samples from their line of bottles Antioxidant Super Teas. The five new POMx flavors are: Pomegranate Lychee Green, Pomegranate Peach Passion White, Pomegranate Blackberry, Light Pomegranate Hibiscus Green and Light Pomegranate Wildberry White. The light teas have only 35 calories per 8 ounces. 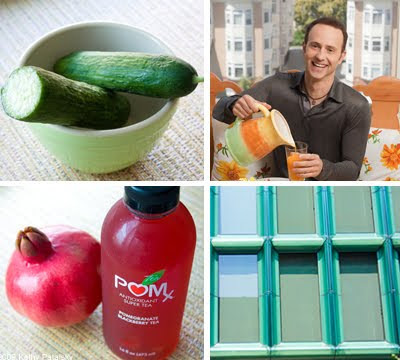 POMx has more antioxidant potency than red wine, green tea, grape and acai extracts. And of course it's the only tea that contains POMx. "Effortless Luxury Living is the essence of 40 Bond, a sophisticated new concept in urban living created by Ian Schrager." 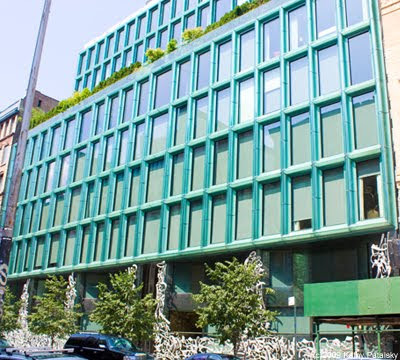 "The building, designed by the eminent Swiss architects Herzog de Meuron, is an architectural masterpiece." Another awesome dude that I met this week was Joshua Katcher, author or the blog: The Discerning Brute. It's slogan: "Fashion, food and etiquette for the ethically handsome man." This blog is awesome. I haven't seen many guy-friendly Eco-conscious, vegan themed blogs. And he updates pretty frequently which is nice. Send all your ethically handsome guy and pals over to this site. Great slogan too. 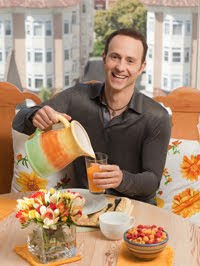 Did you catch the brand new Food Network show: "What Would Brian Boitano Make?" It was awesome. Fun, entertaining and full of great ideas-most of them pretty healthy, although not vegan. I loved BB's 'goat cheese' balls appetizers. I could easily make this into a vegan appetizer by using vegan goat cheese. Hm..first I need to learn how to make that gosh darn yummy vegan goat cheese-like the kind I tasted at VC! 8. Happy: The Bear that Made it up the Ladder. A happy story to round out your week. 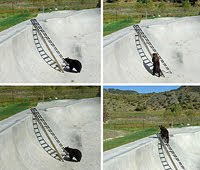 This poor little bear got caught in a skateboarding park ditch. Luckily, some nice human friends helped him out be placing a ladder in the ditch. And also luckily, this smarty bear figured out how to climb up the ladder! Smart bear. Cute pics. This is an awesome company doing great things to help ids get healthy. Bravo! Tofu Rancheros from Ellens New England Kitchen. Chocolate Mouse Cake from Lemonpi. Sour Cherry Pie from Hungry Face. Coconut Ice Cream from Novel Eats simply vegan. Indian Style Zucchini Patties with Tamarind Chutney from Chocolate Chip Trips. Beet Salad with Maple Mustard Vinegarette from Two Blue Lemons. Fresh Corn Polenta with Oyster Mushrooms by Vegan Chow. Got an awesome new vegan, healthy, wellness, happy, beautiful, fun find or discovery??? Leave it in the comments of contact me.